$1,399.98 Seen a lower price? 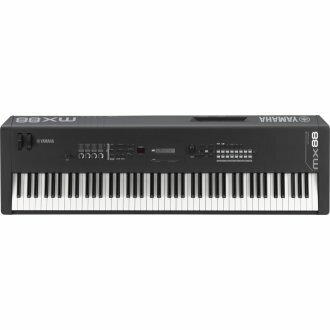 The Yamaha MX88 Keyboard Synthesizer is the complete solution for the modern piano player needing realistic piano action, inspiring synth sound and easy connectivity to computers and iOS devices. The MX88 features a Graded Hammer Standard (GHS) weighted action. GHS weighted action has a heavier response in the low keys and a lighter response in the high keys. 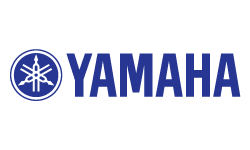 This provides realistic acoustic piano touch and response. Special matte black key tops absorb moisture and remain tactile after extended use, perfect for long practice or performance sessions. Don't sacrifice sound for portability - get the MX88! The MX88 is a lightweight and portable music synthesizer with 88 full-sized, touch-sensitive keys and over 1,000 Voices from the legendary MOTIF. Amazing re-creations of orchestral strings, woodwinds, pipe organs, brass and more make the MX88 an inspirational tool for orchestrators, educators and producers. For the aspiring producer, the highly expressive and playable acoustic and electric guitars, basses, tonewheel organs and drum kits offer a powerful and professional sonic pallete. - FM Essential is a FREE 4-Operator FM synthesizer app for iOS. The standard version features 10 Voices, but connecting the MX88 Music Synthesizer (via the Apple Lightning to USB Camera Adapter - not included) unlocks a full 271 FM Voices from classic '80s to cutting-edge modern EDM. Full Voice editing capabilities are also unlocked. - FM Essential also features built-in effects, EQ, drum phrases and a step sequencer for automating your control changes. - The MX88 is more than a great-sounding synthesizer. - The MX88 can work with iOS applications, DAW software and software synthesizers on Mac and PC. Building on the same core technologies found in Steinberg's Cubase advanced music production software, Cubase AI is a special compact version offering all the basic tools for recording, editing and mixing everything from the basic idea to the final masterpiece. Cubase AI offers powerful yet easy-to-use software tools for a large range of music styles -- exclusive to customers of selected Steinberg and Yamaha hardware. - The MX88 is more than a great-sounding synthesizer; it's the hub of your studio! - The MX88 is USB audio and MIDI class-compliant, letting you record and playback stereo audio to and from your computer or iOS device. This is perfect when recording the MX88 into your DAW and listening to your mixes through speakers or headphones. - The MX88 does more than connect to your DAW, it's also a dedicated control surface. Use the onboard transport controls with your DAW and interact with plug-in parameters via the control knobs. There are dozens of built-in Remote Control Templates for interacting with popular soft-synths and plug-ins, giving your software a hardware feel. - With DAW remote control capabilities, there's also a 16-channel MIDI interface for using the MX88 as both a keyboard controller and tone generator. - The MX88 is the perfect recording centerpiece. CUBASIS LE2 is the compact version of Steinberg's streamlined, multitouch sequencer for the iPad, providing the same look and feel of its bigger brother Cubasis. Specially designed for quick and easy operation, Cubasis LE2 makes recording, editing and mixing a breeze. Cubasis LE2 places touch-intuitive production tools in your hands, opening a world of possibilities for your creativity.